The exhibition entitled O Tempo e as Formas. 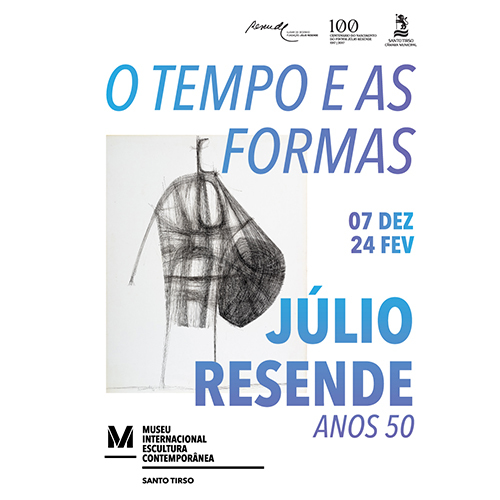 Júlio Resende, anos 50 (Time and Shapes. Júlio Resende, 1950s) allows the viewer to perceive and experience the mutable nature of history, which, when revisited, makes the fundamental experiences of human temporality be questioned and then turned into a seminal narrative, building up a discourse that is constantly being updated and therefore shaped as new perceptions of past, present and future. Within this context, this exhibition has the undeniable property of consolidating identities as “loci of memory”, whose unifying and centralising power was not lost to Júlio Resende, who took those signs as existential traits, reflected in daily routines, as well as in man’s close relationship to the land. Thus, a foundational energy may be projected, from which the present is questioned and the future mapped out. Most of them made in the late 1950s, the drawings selected for this exhibition are chromatically reduced to a minimum expression of black and white, thus stressing the harmonious relationship between figurative and abstract expressions, and providing a more refined and impressive view of the conceptual issues that had always concerned Resende. They also show some of the most relevant features of the artist’s oeuvre, namely figurative representation in which shapes, through a highly distilled, almost minimalistic, composition, have a poetic metre in search of a metaphoric dimension structured around an aesthetic discourse reflecting a system. In this system, drawing is essentially an expression of symbolic representation.